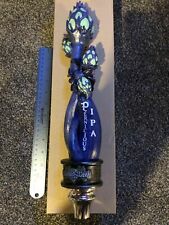 You are bidding on a Wicked Weed Pernicous IPA tap handle. Very awesome looking handle brand new in the box. There is a ruler in the picture to give you an idea on size. lot of 10 beer tap handles . Condition is Used. Shipped with USPS Priority Mail. 10 BEER TAP HANDLES FOR 10 BUCKS. USED BUT IN GOOD CONDITON. A GREAT ADDTION TO ANY MAN CAVE. For Sale - Lot of 8 Various Beer Tap Handles. All used and show normal signs of wear; scuffs and scratches from use. Bud Crown handle is loose. Being sold as is. • Professional Service. Product Info. 2 Pete's Wicked Ale. Winter Ale. Wild Blueberry Ale. Blueberry Wheat Ale. 2 Rolling Rock. TWO GRAIN BELT BEER TAPPER HANDLE KNOBS. Used Beer Keg Tap Handle Lot of 9. See pictures! These are used handles and some show some signs of wear! The Bat creek Brewery handle does have a couple chips on it. This is a good variety of handles they are all different! See pictures! Perfect - Ready to Use or Collectible. VERY DECORATIVE - FULL FUNCTIONAL. Revolution Brewing Tap Handle Mint Anti-Hero Local Hero Chicago Beer. Condition is New. Shipped with USPS Priority Mail. Beer tap handle (does not include stand). This tap is used and in great condition. Its much more cost effective to buy more than one tap. 5 RABBIT CERVECERIA, CHICAGO, IL. All are pre-owned and in good condition with normal scrapes from use. 11" each, they are carved wood with paper labels attached. Sale includes 5 Rabbit Golden Ale / Blank back side. This is a Jugoslavia wood carved item. This barrel is empty and contains NO liquor. There is minimal wear present. There are no breaks or repairs. I have not put a liquid into the barrel so I am unsure if it holds the liquid or if it leaks. Gently clean and polished. Perfect - Ready to Use or Collectible. VERY DECORATIVE - FULL FUNCTIONAL. Budweiser Beer Tap Handle Portland Trailblazers Vintage. Good used condition. Length is a little over 15" weight is 1.6lbs. Free Shipping with USPS Priority Mail. I offer a 100% money back guarantee. 1- 4 1/2 in. long x 3 1/2 tall, a. 75 in. Weighs 10 oz. Stamped with what appears to be "Haydenville Co. USA Haydenville, Mass. All 3 have been tested only by forcing air thru them and opening and closing the handles. Little wear and marks, good display. 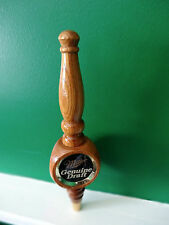 Description: A scarce vintage Carlton & United Breweries Sterling Double Hopped Beer tap. Sterling beer is a discontinued product that was essentially Crown Lager light. Measurements: 20 x 9.5 cm. Weight: 830 g. Condition: Good condition – please check the photos. Schlitz 1950s 1960s Beer Tap Handle Knob 4-sided Plastic Metal Brown Gold 8"
Taps are in good condition. The larger taps are in better condition than the smaller one. The large ones could use some polish on the metal parts but the wood is nice the paint is nice and the stickers are nice. There is some minor denting on the red Budweiser tap. There is some wear on the stickers of the Bud Light taps (very minor). I showed this in the last picture. The small Bud Light tap has some minor chipping at the bottom and one of the edges. On the metal on some of the taps there is some scratches and parts where it can be shined up. Overall, these taps really are beautiful. If you have any questions please don’t hesitate to ask and please view all the photos as they are part of the description. Taps were not tested. I am selling taps as is. The handle has industry standard 3/8" female threads on the bottom and will screw directly to any beer faucet, kegerator, or jockey box. Beer Tap Handle. New in box (NIB), mint condition. Beautiful high quality tap handle. A must for any serious tap handle collection. A great gift for that special beer lover or tap collector. Coors Light Beer Tap Handle - 12 1/2"
Coors Light Beer Tap Handle - 12 1/2". Condition is Used. Shipped with USPS Priority Mail Flat Rate Envelope. STELLA ARTOIS Beer Tap Handle 12"
Beer tap handle (does not include stand). This tap is used and in good condition. Its much more cost effective to buy more than one tap. This is not a BLUE MOON product. Each bottle is milled & retrofitted to accept standard draft faucet threads(3/8-16). The bottles are also processed to enhance appearance. The recessed draft fitting is rock solid & professionally done. YOU ARE BUYING A HEINEKEN BEER TAP HANDLE. USED CONDITION WITH MINOR FLAWS. USED Sold as is. See pictures for gentle wear and tear. Condition is Used. Two tap handles plus six handle toppers, including two Voodoo Ranger toppers, a new in plastic 8 hope pale ale with skull ranger topper, sour saison and pump kick spiced ale! No kegerator?. Upcycled, unique handle! 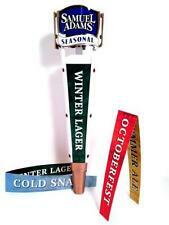 Win this and you will have the sweetest kegerator at the tailgater or mancave or house or bar! See pics for details.